Sorry i am kind of newbie in Vuforia and Unity, but i already have some experience! The idea is simple - when combined C,A,T together - the cat appears and meows. The problem is - it works always only once and i have to move the carton cards really careflly close to each other. I tried many values for distance, but it works the same. 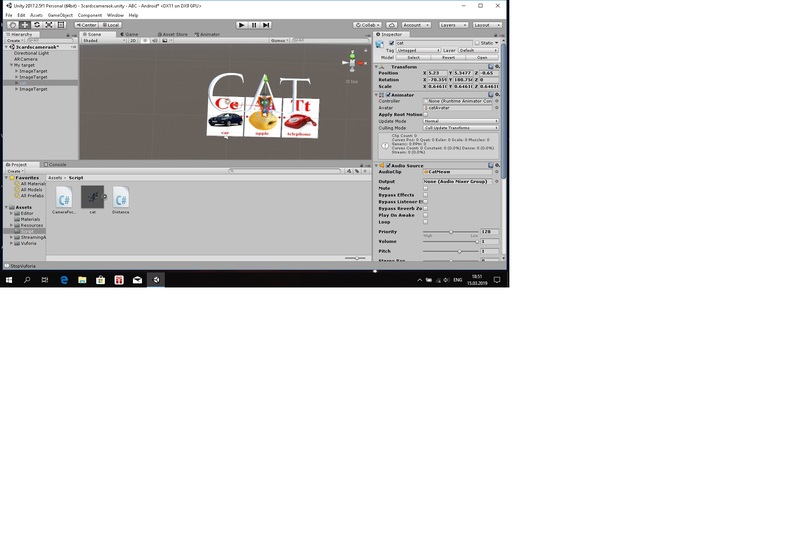 Could anyone help to improve the "sensitivity" in my code and correct something in the code so that the cat always appears for combination CAT, but not only once. You probably should also check the CurrentStatus of the ImageTarget Behaviours to make sure the targets are tracked when you do the distance comparisons. If the targets are not tracked, the augmentations won't be rendered, but more importantly, their pose (position) will not be correct. There also seems to be an inconsistency with the way you activate and deactivate the letters (they'll be set to true every frame). Are you sure you want to delete this conversation? Stay cutting edge. Get the Vuforia newsletter. You are being redirected to login page. If nothing is happening Click here. To reset your password please enter the email address associated with your account. An email will be sent to you with instructions on how to complete changing your password.